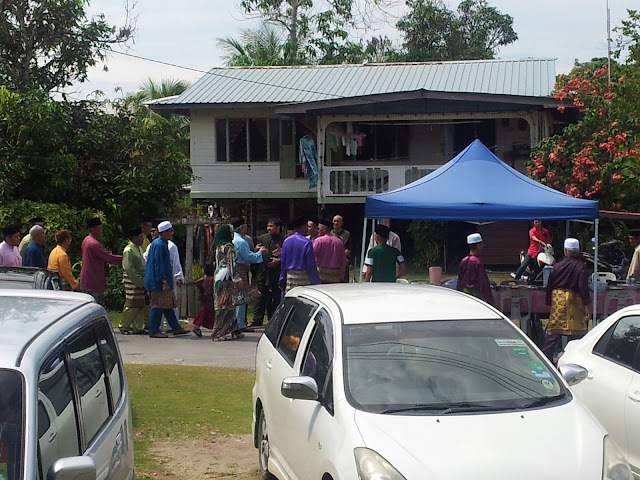 On the 3rd day of Raya, a few members of Hj Sambang's Clan drove up to Igan, Mukah to the grandma's kampung. I was told that we were going for Melanggar Meja or literally 'hit the table' tradition. I had no idea what to expect but tagged along with them. We reached Mukah about 11 something and B drove around Mukah town just for me. Ok tipu. We stopped for a quick meal because all of us were starving. I got to see the town and it's quite happening there. FYI, Mukah is accessible through water transport too. Grandpa and grandma went there a day before us by taking a boat from Sibu. About 3 hours too. 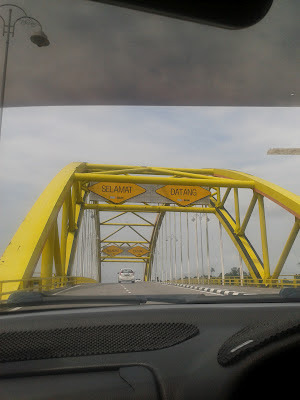 After the meal, we continued to Igan, half an hour from Mukah town and arrived at the village. 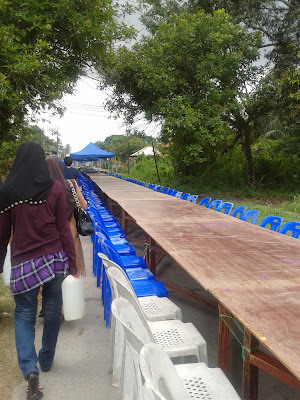 The road to grandpa's house was blocked as they were tables set up along the road. We had to use another way and parked a bit far from the house. The villagers were setting the tables when we arrived. About 3oometres long. The event started at 2pm. 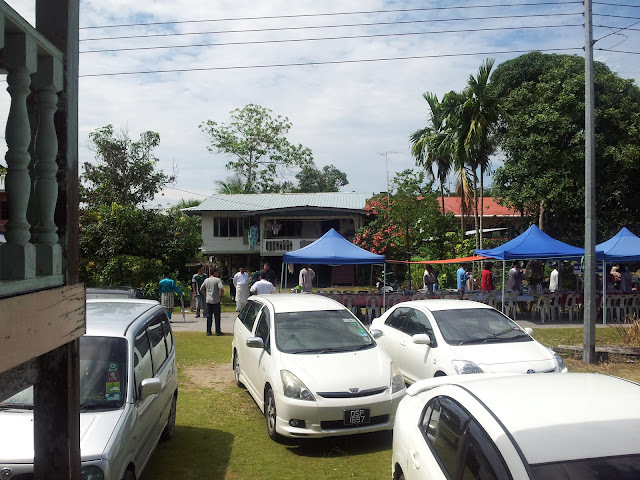 Few elders were waiting for the guests. They arrived and taking seats. 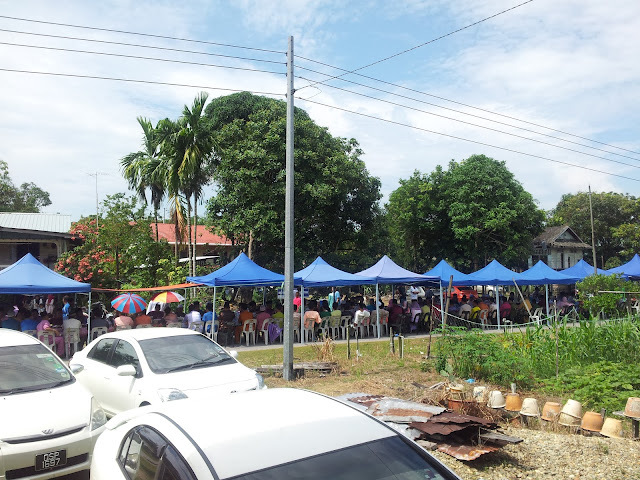 More and more people coming. 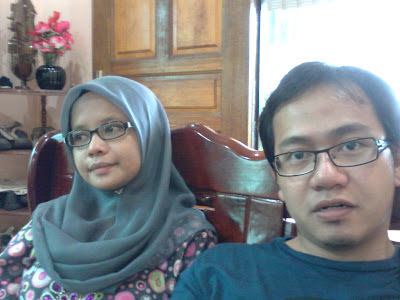 Waiting for the YB to finish his forever speech. I was told that this tradition is uniquely Igan. This cannot be found in other place other than Igan. Now now, wanna know what is Melanggar Meja??? It's a tradition like a open house in big scale. 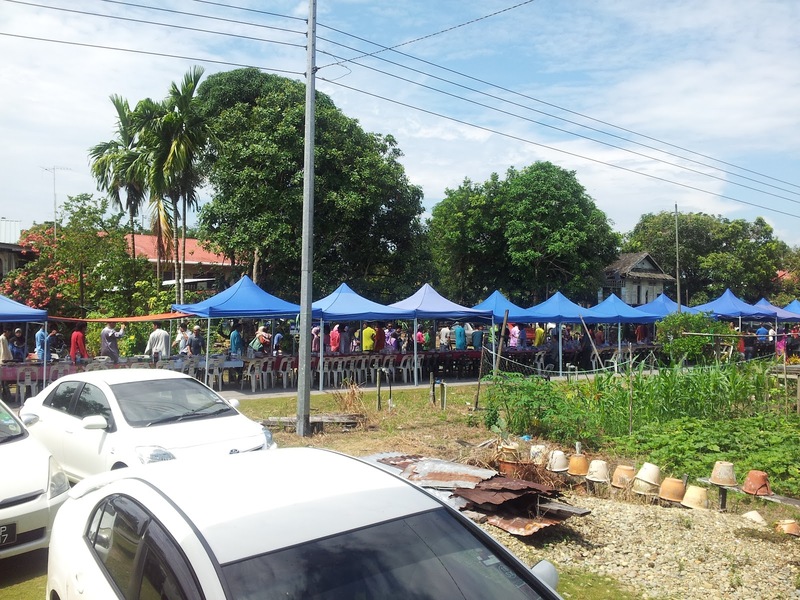 Unlike our official Rumah Terbuka 1Malaysia, this tradition happens when the villagers and the guests bring own food and arrange on the tables. more like a big pot luck. The guests are from the host-village and from neighbouring villages. We couldnt wait till makan time because we had to go back before it's gettin dark. The YB finished his speech almost at 4pm. orang dah kebulor dah! Anyhoo, I googled for this tradition and found an excerpt from last year's newspapers. Enjoy reading!